(What If? II#35) - Lady Deathstrike got a severe hangnail in mid-battle with Wolverine. Comments: Created by David Cullen and Jim Sanders III. One where the pain drove her to distraction and she was defeated by Wolverine. One where the pain pushed her into a berserker rage and she slew, or at least seriously messed up, Wolverine. 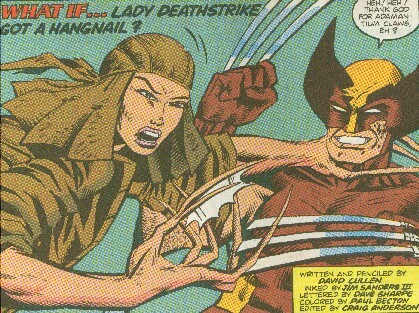 How could Lady Deathstrike get a hangnail? Why am I wasting my time on this?